James Hughes (pictured, left), professor and former dean of the Edward J. Bloustein School of Planning and Public Policy at Rutgers University, was the keynote speaker Monday night at the Suburban Revitalization Forum held by Prism Capital Partners on ON3’s campus in Nutley, NJ. Gene Diaz (right), principal partner with Prism, spoke at the session. Credit: Prism Capital Partners. The redeveloper of the former Hoffmann-La Roche headquarters on the border of Nutley and Clifton, NJ, wanted to get its message out loud and clear to those municipalities: Millennials now rule the workplace, and traditional office complexes are outdated dinosaurs to them. So this week, Prism Capital Partners LLC, looking to win local support for its ambitious plan to transform the property into a North Jersey tech and science hub, hosted two public forums on suburban revitalization. Prism brought in not one but three experts to the former campus of the global drug manufacturer to lecture about how changing demographics and technology have forever disrupted business-as-usual for commercial real estate, particularly office and retail space. Isolated one-tenant office complexes are obsolete; mixed-use, live-work-play developments that appeal to the collaboration and social interaction favored by millennials are in demand now, according to the keynote speaker at Monday night’s forum, James Hughes, a professor and former dean of the Edward J. Bloustein School of Planning and Public Policy at Rutgers University. To succeed, developers need to redefine workplaces and adapt their projects to the needs and priorities of this demographic, those born from 1980 to 2000, he explained. It’s no wonder that Prism is pulling out all the stops to explain why it is looking to add new uses – housing, retail, lifestyle amenities and a hotel component – that appeal to millennials to the rolling campus that once housed Roche’s North American base. Located at 340 Kingsland St., the developer has rebranded the project as ON3, a reference to its prominent location on Route 3, the busy corridor that leads to the Lincoln Tunnel and Manhattan. Prism and the state of New Jersey have a lot riding on the redevelopment of ON3, and the developer will need approvals from both Nutley and Clifton for its mixed-use master plan for the site, which Gene Diaz, principal partner of Prism Capital, said will be submitted in the next month or so. In New Jersey’s more than 500 towns, development proposals that include multifamily residential uses often draw opposition from municipal officials, who fear an influx of new residents that will add a burden to their infrastructure and services, particularly schools. At the first forum on Monday, Diaz addressed the roughly 200 attendees and said his firm is trying to attract a new breed of company to the Roche site. The crowd included residents and officials from Nutley and Clifton and even New Jersey Congressman Bill Pascrell’s office. Prism said it is seeking to “reinvigorate” and “reignite” the property to draw businesses, and wants residents and local officials to understand the process and reasons behind its plans to reposition ON3 as a science mecca, Diaz told them. And ON3 must appeal to the millennials who will work at these companies, he said. That demographic has replaced baby boomers as the largest sector of the U.S. workforce, and it prefers walkable environments where it can find “food, fun, fitness,” Hughes said. Prism – based in Bloomfield, NJ, not far from the ON3 site – purchased the 116-acre property and its portfolio of five buildings in September 2016 for $88.5 million, according to CoStar data. That was roughly 5½ years after Roche announced that it was closing the property and putting it up for sale. The New Jersey Economic Development Authority (NJEDA) so far has offered roughly $60 million in tax incentives over a 10-year period to draw companies to ON3. Those financial lures have helped Prism land some crucial tenants, most notably a new medical school – the Seton Hall-Hackensack Meridian School of Medicine – as an anchor tenant. Along with other commitments, Prism so far has leased 700,000 of the existing 1.2 million square feet at the site. The developer also says that it has signed multiple letters of intent with additional office, research and development and lab-space users. Working with its design and planning experts, Prism has crafted an initial mixed-use redevelopment proposal, posted on its ON3 website, that not only repopulates the existing space at the site, but also includes 1.2 million square feet of future office, R&D and medical space; a 180-room mid-rise hotel; 180,000 square feet of retail space, and 1.1 million square feet of residential development. Prism said it must create such a varied environment in order to revive the former Roche site and to attract and retain high-quality firms, according to Diaz. Local officials need to understand the cultural shifts that are shaping Prism’s plans, he said. “The issue that we see, the biggest problem that we as a developer face with dealing with municipalities, really is about education,” Diaz told CoStar News after Monday’s seminar. ON3’s first major tenant is the private medical school, the first new one in decades in New Jersey, which is being launched through a partnership of Seton Hall University and Hackensack Meridian Health. The new school has committed to a long-term lease for two of ON3’s buildings, roughly 480,000 square feet, and will be getting $16.9 million in tax incentives from the state. About two-thirds of that space will house the new four-year medical school, as well as Seton Hall’s School of Nursing and its School of Health and Medical Sciences, which will relocate to the ON3 campus from South Orange, NJ. The other third of that space will house the Hackensack Meridian Health John Theurer Cancer Center. The 15-story, 300,000-square-foot former Roche headquarters building at 200 Metro Blvd., where the two suburban revitalization seminars were held this week. Administrators from those schools are slated to move on-site in the next two weeks, according to Diaz. Last year, bio-fabrication company Modern Meadow Inc. relocated from Brooklyn to a third ON3 building after being offered $32.2 million in tax incentives from the EDA. It has leased 73,000 square feet and now has 90 employees at the site, double from 45 three months ago, with the anticipation that number will rise to 250 within three years, Diaz noted. Two other companies have also been offered state tax incentives to come to ON3. Quest Diagnostics Inc., which now has its headquarters in Lyndhurst, NJ, would receive $5.51 million to relocate one of its facilities from Teterboro, NJ. Under the incentives approved by the state, Quest would build a 250,000-square-foot facility at ON3. Clothing retailer Ralph Lauren will get $3.3 million in tax incentives if it moves a facility that it has in Lyndhurst, NJ, to 235,000 square feet at ON3. Joshua Cohen, a senior director at Cushman & Wakefield, is handling office and R&D leasing for the two remaining structures at ON3: Roche’s landmark former 15-story headquarters building, which has roughly 300,000 square feet, and a seven-story, 255,000-square-foot office property. Prism held its two seminars in the high-rise building’s auditorium. The high-rise building gives “more of an urban feel in a suburban environment” to ON3, according to Cohen. ON3 has the opportunity to piggyback on the Garden State’s standing and reputation as a bio-pharmaceutical stronghold. Cohen’s firm, Cushman & Wakefield, earlier this week issued a report on how life sciences have been a driver of New Jersey’s economy and real estate market. The life-sciences industry leased more than 1 million square feet of office space in the state last year, according to the report. And this sector contributes $47.5 billion to the state’s economy annually. Adding to New Jersey’s life science bona fides is the fact that the state is also home to the headquarters of 13 of the Top 20 global bio-pharma companies in the nation, according to Jason Price, tri-state suburbs research director for Cushman & Wakefield. Once the existing buildings on ON3’s campus are repositioned and leased, Prism can proceed to develop new buildings on the site, Diaz said. CBRE is handling the development’s retail leasing. The official master plan that Prism will soon submit to Clifton and Nutley will include a hotel that can serve as a conference center. “Hospitality is something that’s important to have, and there’s a lot of interest from developers,” Diaz said. Prism received a half-dozen responses to its request-for-proposals for the hotel, and winnowed those down to two, according to Diaz. “And we’re going to select one shortly,” he said. Most of New Jersey’s office stock was constructed during a boom from 1980 to 1990, much of it consisting of one-tenant developments built for the baby-boomer generation and “planted in a sea of asphalt,” according to Hughes. At that time, boomers were abandoning cities for the suburbs. But in recent years there are at least a half-dozen disruptors to that old scenario, according to Hughes. First, there has been a seismic demographic shift as baby boomers have aged and are now at retirement age, he said, replaced by millennials in the workforce. Next, the digital age of computers, cellphones and the internet has “untethered” workers from office space, “redefining the nature of white-collar work,” Hughes said. Millennials, the “digerati,” were “born and reared in an unprecedented era of surging information technology,” he said. They prefer the urban environments, such as Jersey City, NJ, that their elders fled, he added. 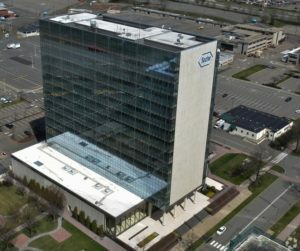 There are sprawling suburban office campuses, such as the former Bell Labs campus in Holmdel, NJ, that have been successfully repositioned as vibrant mixed-use developments, according to Hughes. 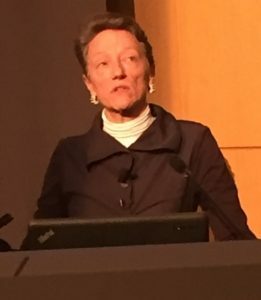 Ellen Dunham-Jones, an expert on suburban redevelopment, was one of two speakers Thursday night at a seminar sponsored by the developer of ON3 at the former Roche campus. The second forum, “The Big Design and Redevelopment Project of the Next 50 Years,” held Thursday night featured two speakers. Ellen Dunham-Jones, an expert on suburban redevelopment and co-author of “Retrofitting Suburbia: Urban Design Solutions for Redesigning Suburbs,” offered many examples of the repurposing of suburban properties. In her research, she said that she has collected 1,500 examples of such redevelopment. Dunham-Jones also echoed Hughes’s comments about millennials, and added downsizing empty nesters, to the groups who want “stimulating” work-live-play environments with “walkability” today. “Urbanism has become the new amenity, especially for the workplace And in order to make this work you have to have residents,” she said.